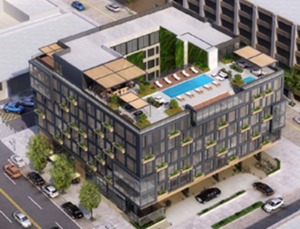 (CHICAGO, Ill; August 17, 2016) - Oxford Capital Group, LLC announces today the acquisition of 1400 Cahuenga, Hollywood, CA with plans to develop The Godfrey Hotel Hollywood, a luxury lifestyle hotel. Slated to open in 2018, the hotel will feature approximately 200 hotel rooms, a chef driven restaurant and rooftop pool with panoramic views. This will be the third hotel within the award-winning Godfrey brand, including the flagship Chicago location and sister property in Boston. "We are excited to have found such an attractive opportunity in Los Angeles as it is a top target market for us as we continue our disciplined growth. We are making what we believe is a smart real estate investment in the rapidly emerging Hollywood submarket while simultaneously expanding our Godfrey brand to the west coast," says John W. Rutledge, founder, president and CEO of Oxford Capital Group, LLC and its wholly owned affiliate Oxford Hotels & Resorts, LLC, the Chicago-based investor, developer, and manager. "This dynamic area within Hollywood is a perfect fit for our Godfrey brand and its audience," says Sarang Peruri, Principal at Oxford Capital Group, LLC and Oxford Hotels & Resorts, LLC. "We are excited to bring the truly unique rooms and food & beverage experiences The Godfrey has become famous for in Chicago and Boston in a custom and authentic manner that we hope will quickly feel like an organic Hollywood tradition." The transaction was brokered by Mike Condon of Cushman and Wakefield. The terms of the sale are not disclosed at this time. For more information, please visit www.GodfreyHotelHollywood.com, www.Oxford-Capital.com, and www.OHRllc.com. The Godfrey is a luxury lifestyle brand that is part of Oxford Capital Group's growing national collection of lifestyle hotels. The Godfrey was named one of the Most Anticipated Hotels Opening in 2014 by Fodor's Travel and one of the Top 10 Hotels in Chicago in 2016 by Travel + Leisure magazine. The Godfrey has also earned three HSMAI Adrian awards, a Conde Nast Reader's Choice Award and Event of the Year award from Nightlife and Bar Awards. The Godfrey is focused on differentiated design, a high touch service culture, leading edge technology, and distinctive restaurant and nightlife venues with careful attention to creating organic and memorable experiences. The Godfrey name stems from a European word meaning "peace" and "welcome". Oxford Capital Group, LLC is a national real estate investment, development and management firm. Oxford Hotels and Resorts, LLC is its wholly owned hotel operating affiliate. Oxford, its affiliates and principals have been involved in approximately $2.5 billion of real estate and private equity investments, including approximately 13,000 hotel rooms and over 2,000 assisted living units and nursing home beds. The firm's primary areas of focus are hospitality, mixed-use, senior housing, multifamily, urban retail, parking, and other operationally intensive forms of real estate, including health, fitness, spa, athletic and sports/entertainment destination clubs, and entertainment destination outlets including hotel rooftop venues. Oxford's geographic focus include the nation's top metropolitan areas: Boston, Chicago, Los Angeles, Miami, New York City, Portland, San Francisco, Seattle, metro Washington D.C., select resort markets, and other markets with unique attributes including Charleston, New Orleans and various markets throughout Florida. Its current portfolio includes a growing collection of lifestyle hotel brands including Bay Harbor, Cass, Essex, Felix, Godfrey and LondonHouse. For information, visit www.oxford-capital.com and www.ohrllc.com.